Congresswoman Carol Miller meets with Mason County Development Authority Director John Musgrave and others on Friday in Point Pleasant. Congresswoman Carol Miller touring the AEP Mountaineer Plant in New Haven. 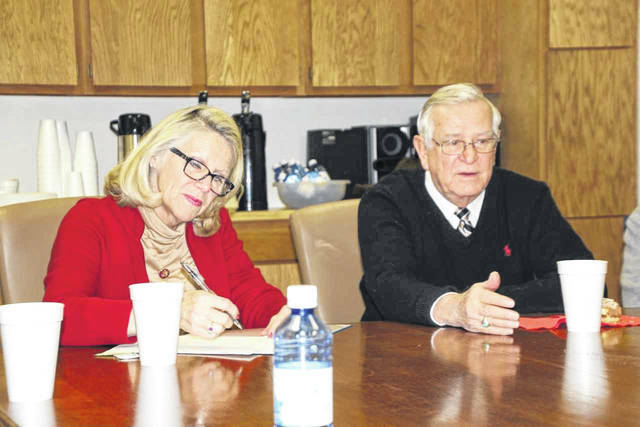 POINT PLEASANT — Congresswoman Carol Miller (R) was in Mason County on Friday for her first official visit to the Third Congressional District as its representative. 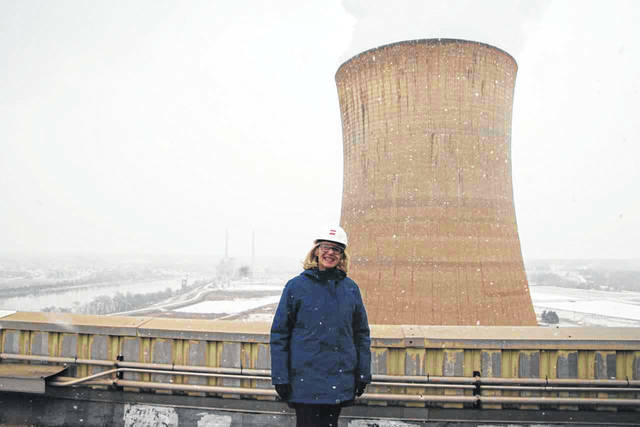 Miller began her day meeting with local officials at the Mason County Development Authority Office in Point Pleasant and then traveled to American Electric Power’s Mountaineer Plant in New Haven. Miller also stopped by the Point Pleasant Register to talk about her visit and her new responsibilities in Washington. Much has been made of the diversity of this year’s incoming congressional class which contains the most women ever elected to the House. Its been dubbed the so called “pink wave.” Of those newly-elected faces, Miller was the lone GOP female who was sworn in, making her somewhat of a political unicorn, which seems to be a label she’s happy to embrace. Something else that may make her a unicorn in this day of partisan politics, is her openness to working across the aisle. Miller said she felt it’s important to “meet in the middle” on issues which require compromise, and finding commonality in the details. Miller said she had been greeted by Speaker of the House Nancy Pelosi as well, as appointments and committee work have already begun in Washington. Miller recently received her committee assignments which include: the House Transportation and Infrastructure Committee as well as the House Committee on Oversight and Reform. Subcommittee assignments include, Highways and Transit; Coast Guard and Maritime Transportation; Economic Development, Public Buildings and Emergency Management. She’s also been named as an assistant deputy whip, working with House Minority Whip, Congressman Steve Scalise (R-Louisiana). On Friday, Miller told the Register, her appointment on the Transportation and Infrastructure Committee gives her a unique opportunity to serve her district and to foster the development of projects in Mason County. She said her visit included discussions on economic development, rivers, roads and rails, energy and the issue of youth leaving the state – the latter of which she feels has to do with employment opportunities. In terms of economic development, Miller was updated on the need for infrastructure so that locations are “site ready” which has been an issue in Mason County and other areas, when it comes to stalling potential development. She said Friday’s visit was about listening to concerns and being updated on what’s going on in Mason County so she can better serve her constituents moving forward. In that vein, Miller’s office will be offering mobile office hours in Mason County, just as her predecessor Evan Jenkins did. She said she also hopes to partner with her counterpart in Ohio, Congressman Bill Johnson, to host local job fairs in their districts, as Jenkins and Johnson did. Her office has also maintained experienced staff to assist constituents with various issues. Miller has now found herself not necessarily walking in the shadow of her father but certainly in some big footsteps. Still, the first day in Washington, D.C. as a congresswoman, was uniquely her own. As for what she wears to take those steps, many times she’s in tennis shoes on the House floor. They’re practical and they allow her to get where she needs to be in a hurry. “We have a long walk to go anywhere,” she said.